← Breaking news . . . The Internet is alight with the news of David Foster Wallace’s suicide. This is hitting me hard, not only because of Wallace’s youth, talent, and unfinished business, but because of my sense that he was not the type of artist who did this. In his writing, and especially in his magazine writing, I always found an authenticity and decency and all-around avoidance of self-tortured preening. I’m not saying we can (or should) spot suicidal hints in an artist’s work, but I am saying Wallace connected to real emotions and real concerns in a way that separated him from many of his pomo peers. This doesn’t feel like the time to worry about who broke the news, but I found out via the LA Times‘ blog. 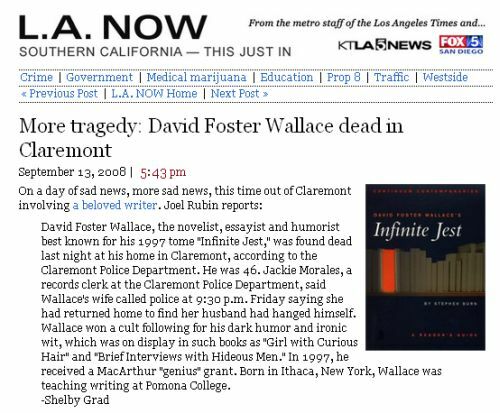 In choosing an image to accompany the story, the reporter posted the wrong book cover—not of Wallace’s opus, Infinite Jest, but of Stephen Burn’s David Foster Wallace’s Infinite Jest: A Reader’s Guide, a short volume in the “Continuum Contemporaries” series. The Times‘ unintentional slip feels like a fitting sort of tribute—with possible implications for Wallace’s style and audience, his relationship to academia, and even the state of fiction today—but I don’t feel like parsing it. I just feel sad. 2 Responses to R.I.P., D.F.W.